Oscar Fashion is a heavy book––literally, but not figuratively. The pages are made with the same process as hardcover textbooks, giving it the illusion of heft. At 192 pages, it certainly is long. However, the book is not as substantive as one would hope. Of course, nobody opens a book like this expecting Tolstoy; but one does expect more detail than this book actually provides. Instead, the book is laid out like an extended People magazine, with little intellectually or aesthetically stimulating content. One of Oscar Fashion's most devastating shortcomings is the lack of vintage photographs. Granted, this book has photos on every single page; but the book only represents many Oscar years with one page of photos, which means three or four photographs for, say, 1944, or 1966. At the beginning this is understandable, since early Oscar ceremonies were not televised or photographed; for some years, only a few pictures are known to exist. However, for later years, showing only three or four gowns is simply inexcusable, and necessitates grievous omissions. The book has some persistent features, which I would have liked to see expanded. The start of every decade (every chapter covers a decade) shows three different films which were somehow influenced or innovative in fashion, including The Graduate, Breakfast at Tiffany's and so on. This is a very interesting topic, one I have tried to do justice to. However, three films, for ten years, is a little on the skimpy side, especially for a book devoted to a movie awards ceremony. The book also features different outfits that persist through the years, such as The Big White Dress. I like this idea; it's interesting to see common threads running through oscar fashion, from the 1940s to the 1990s. This is one of the more interesting parts of the book, and I would have liked to see more of these features, with more detail (i.e. why such-and-such was a persistent feature). On balance, though, the book is not worth buying, and skimming through it is likely to be a somewhat frustrating experience. Those looking for inspiration should go elsewhere. Buy Oscar Fashion at Amazon.com . 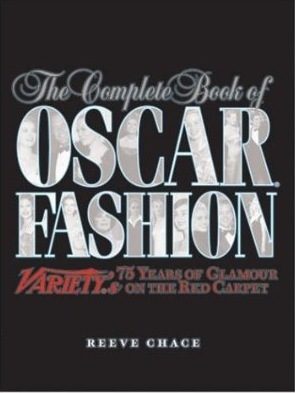 Oscar Fashion is part of our book review section.